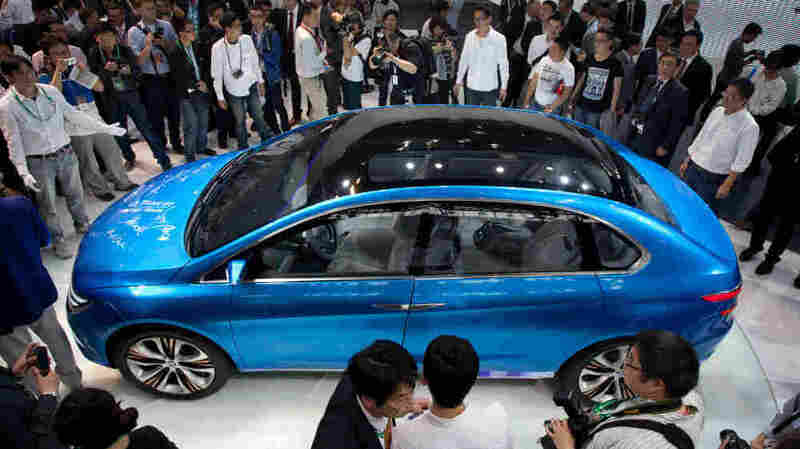 Carmakers In China Rev Up As Industry Shifts East China is now the world's largest car market, and a crucial one for Detroit companies. Chinese consumers bought 18.5 million vehicles last year, and foreigners, especially Americans, have played a key role in developing the industry. But that's changing, as Beijing tries to strengthen domestic carmakers. The Beijing auto show runs this week in what is now the world's largest car market, and a crucial one for Detroit companies. General Motors just announced it will open 600 more dealerships in China, where it sells more cars than it does in the U.S. Last week, Ford announced construction of its fourth Chinese assembly plant. For longtime American auto executives in China, witnessing the shift in the global auto industry is dramatic. Every month, a group of auto executives gathers at a bar in the heart of Shanghai. They drink beer, swap industry info and talk about the wild ride that is China's car. "Shanghai is the new Detroit," says Dan Collins of Port Huron, Mich. "They make a lot more cars here than in Detroit." Collins, whose grandfather tested cars for Henry Ford, came to China in 1998 as a student from Michigan State. Back then, Chinese consumers bought just 1.5 million vehicles annually. Last year, that number was 18.5 million. Shanghai is the new Detroit. They make a lot more cars here than in Detroit. "You talk to anybody in the automotive industry, it's all China, China, China," Collins says. His career is a kind of classic, expatriate Horatio Alger story in China. Hired by Michigan-based auto parts maker Delphi, which was then the world's largest, Collins learned Chinese on the factory floor and rode the wave of the country's breathtaking economic growth. "I originally planned to come for three months, but then I became a manager in only a year. I was an executive in less than five. So before I was 30, I was an executive in a major Fortune 500 company," Collins says. "That was something I never could have done in the United States." Today, following a path neither he nor his grandfather could have imagined, Collins is the 38-year-old CEO of a Taiwanese company that makes brake discs. He runs a factory in the city of Ningbo, just south of Shanghai, where he is the only native English speaker among 300 employees. Collins says what makes China such an exciting place to work is the pace, challenge and unpredictability. It's a place where the industrial culture is still raw, so on any given day, you never know who you'll meet. Collins recalls going to a scrap yard to negotiate a deal. A mechanic works on a Buick at a General Motors dealership in Shanghai last December. GM just announced it plans to open 600 additional dealerships in China. The company now sells more cars in China than it does in the United States. "They're basically run by local mafia bosses," he says. The boss "doesn't have his shirt on, [and] as I'm in the meeting discussing with him the pricing, he puts one of his workers in a headlock and wrestles him out the door. These are the kinds of things that happen only in China." Jacob Schenkel worked for Delphi as well. He left after the company went bankrupt in 2005. Later, he returned to work for an old Delphi subsidiary that made steering systems. But in a sign of the times, Americans no longer owned the division. It had been sold to the Chinese government. "If three or four years ago, you said Chinese companies are going to buy U.S. assets, you would have scared people to death, because they are going to clean house," Schenkel says. But he says working for a government-owned company isn't so bad. Chinese companies often buy foreign ones for technological know-how and to learn from foreign managers. Schenkel says the Chinese government serves as the company's board of directors, but leaves management pretty much to the Americans. He says his company and some auto joint ventures increasingly feel like hybrids. 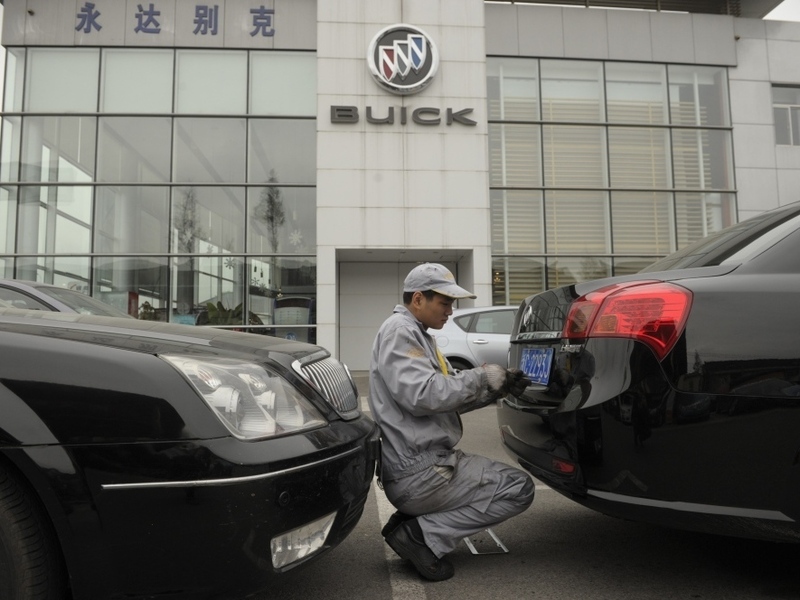 "What's Chinese and what's foreign is blurred more than ever, and if you take Shanghai Automotive [Industry Corp., one of China's biggest automakers] and General Motors, it's hard to tell sometimes who's invested in who," Schenkel says. Schenkel and Collins embody the shift from West to East. But foreigners are wary of working for Chinese car companies, says Michael Dunne, author of American Wheels, Chinese Roads: The Story of General Motors in China. "It's tough. Many have tried and most have said: surrender," Dunne says. He says the culture inside a Chinese auto firm can be combative, opaque and baffling. "You've got to get ready for a fight, a battle every day, but time and time again, China's culture digs in and — more or less — spits them out," Dunne says. A Future In China For Expats? After incredible 33 percent growth in 2010, China's auto market has cooled. And there are some unsettling signs for foreign companies. Beijing is considering restricting government auto fleets to Chinese cars to help local companies. "There's no doubt that China wants to have its own cars with its own brands and be the car factory for the world," Dunne says. Most American expatriates in Shanghai return home after several years. But there are some, like Jacob Schenkel, who are in China for the long haul. "I'll probably be here the rest of my life," he says. It makes sense: Schenkel is from Chicago, but he got his MBA in Shanghai. He is married to a Chinese woman, and his professional experience is in China — where the car market is expected to grow for years to come.